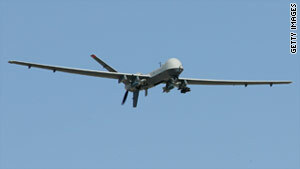 More than 100 U.S. drone strikes happened in Pakistan last year, according to the New America Foundation. (CNN) -- The Pakistani government would like the CIA's aggressive drone campaign "suspended" and only resumed under "new rules" and "formalized terms," according to a Pakistani military official familiar with discussions between the two nations. Only then, in the instances where there was "compelling evidence" that a militant "high value target" had been located and that the operation was jointly coordinated between Pakistan and the United States, would the Pakistani government sanction a drone strike in the future, the official said. The Pakistani official pointed out that there have been more than 100 reported CIA drone strikes in Pakistan in 2010 -- a record number -- yet almost no one killed in these strikes were "high value targets," such as leaders in al-Qaeda or allied militant groups. Instead, the official said, the vast majority of the victims of the strikes have been militant foot soldiers or civilians. According to an independent count of the drone strikes maintained by the New America Foundation, there were 118 U.S. drone strikes in Pakistan in 2010 killing somewhere between 600 and 1,000 people. Only a dozen of the victims of the 2010 drone strikes in Pakistan were described as militant leaders in reliable, independent press accounts. The Pakistani official says that the fact that drone strikes are overwhelmingly not killing militant leaders is "infuriating the masses" in Pakistan. Indeed, public opinion polling shows that nine out of 10 Pakistanis have an unfavorable view of the drone strikes. Relations between the CIA and Pakistan's military intelligence agency, known by its initials ISI, became "strained" says the Pakistani official, following the incident when CIA contractor Raymond Davis shot and killed two men in Lahore, Pakistan, in late January. On March 17 -- the day after Davis had been released from a Pakistani jail following the payment of more than $2 million in "blood money" to the two victims' families -- a CIA drone strike killed as many as 45 people in Pakistan's tribal areas. After the attack, Gen. Ashfaq Parvez Kayani, the powerful army chief of staff and effectively the key driver of Pakistan's foreign policy, made a rare public rebuke of the drone strike, saying that "peaceful citizens" were "carelessly and callously targeted" and that the strike was "unjustified and intolerable." According to the Pakistani official, the March 17 drone strike "pissed off everybody" and was seen as an example of the "extreme arrogance" of the U.S. government, and helped precipitate the visit to Washington on Monday of Gen.l Ahmad Shuja Pasha, the head of ISI, for talks with CIA Director Leon Panetta. In addition to a significant reduction in the drone program, the Pakistani government also wants CIA "covert operations" in Pakistan that are unsanctioned by the host government to cease, citing Davis as an example of such a rouge operator. The Pakistani official said "we haven't discussed specific numbers" of CIA personnel we would like to leave Pakistan -- where the agency maintains one of its largest overseas stations -- but the official said they do know that Davis did not act alone, and there are "too many others" like him in the country.